With consistent rain falling in the Treasure Valley race week, highs in the 40s and even 50s, and quite muddy conditions for course marking on Wednesday, most of us were resigned to a Fest of Classic Wilson Creek Mud. However, the rain didn’t hit Wilson Creek on Thursday or Friday giving the warm sun and mild temps time to dry things out immensely. The weather held, and we were treated to 50 degree temps, full blue sky and sunshine, and drier trails and roads than ever. Water was running in Wilson Creek, but despite that section of sloppiness, most people finished with a suspicious lack of mud or water on their shoes. Shorts and t-shirts abounded. People regretted wearing tights. Fires were superfluous, and the feelings of well-being ran strong. We’ll be surprised if we ever see another April day in January at Wilson. Best. Day. Ever. 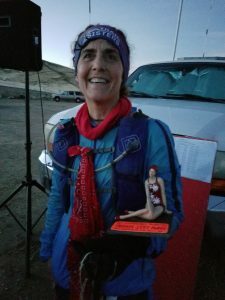 Congrats to our “Frozen Stiff” 50k-er for ‘basking in the sun’ the longest: Stephanie Heimberg with a time of 10:31:24 received the swimming lady statue as a result of her great work and most extended enjoyment of the beautiful day and awesome course. Warm temps and some early-week precip made mud the talk of the town prior to race day. Course marking day was a mess, and we knew we couldn’t drive past the Rocky Road aid station under any circumstances. Race morning dawned colder than expected, gifting runners with firm trails for the morning. Runners on the course into the afternoon got the full brunt of the mud, however, making this a Fruddy year, but still one of the nicest race days yet. The Canyon County ATV club would be needed in full force to transport aid stations out in the relatively warm afternoon that was dotted with rain showers. We even saw a little sun and blue sky throughout the day. 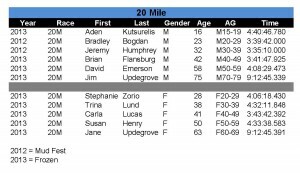 3 men went sub-5 hours in the 50k for a new CW course record of 4:19 by Mike Anderson. New CW course record of 2:55 by Mike Knutson. Our favorite teenage duo showed up again this year as 16 year olds and once again went one-two, with a new CW course record of 1:14 by Jackson Brill. New course record of 34:16 was set by Chip Cooper. An inversion in the lower elevations and start/finish area kept things hoar frosty and cold, but runners enjoyed firm trails and some sunshine higher up, for an all around great experience. 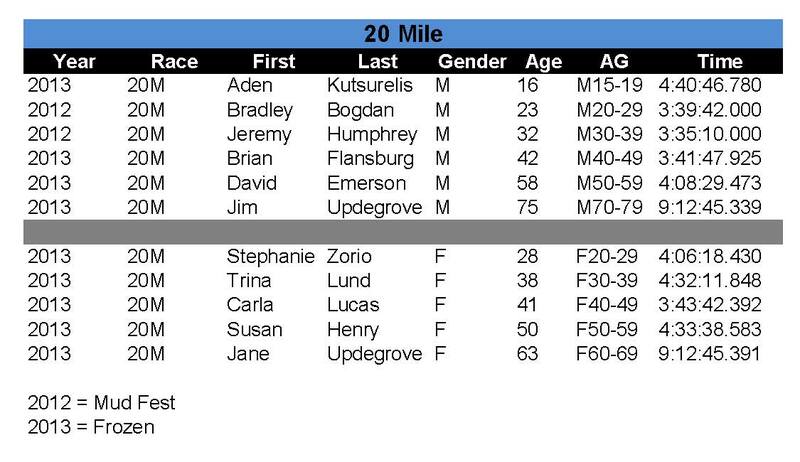 Totals: 225 starters; 219 finishers; 40 DNS; 6 DNF = pretty awesome outcome! Thanks to all of our sponsors and volunteer clubs and agencies, without whom we would not have an event: The Pulse Running & Fitness, Scott Sports our Trail Series title Sponsor, TrailRunner Magazine, Hammer Nutrition, Blacks Creek Guide gear, Dennis Ahern Woodworking, Rolling H Cycles, GoLite, Vitality With Sparkle, Tony Salazar and Tempus Photo Design, The Cascade Project, Starbucks Nampa, Blessing Plumbing Service, ABC Sanitation, SignHype, Dillon Plumbing, Idaho Sporting Clays & Hunting Club, Nampa Smiles, Rich Marion with Pro Race Timing, and photographer Allen Sandquist; The Canyon County ATV Club, The Boise ATV Trail Riders, The Murphy Reynolds Wilson Volunteer Fire Department & Quick Response Unit, the Bureau of Land Management Owyhee Field Office, and the Boise County Amateur Radio Club. Special thanks Rick Harris of the Canyon County ATV Club for coordinating our ATV volunteers and to Mike Blessing for EVERYTHING. Thanks to the Boise Trail Runners and all the other runners, family members, and lovely volunteers for enduring the Siberian temps to aid our runners. The commendations from runners about the volunteers are many. Thanks to Tony Huff, Dennis Ahern, Brian Nebeker, and Ben Blessing for marking the course, and to Amy King, Jon Kinzer, David Tarkalson, Mark Hutchinson, and Rich Hale for sweeping our courses. THANKS to Rich Marion for providing professional timing. 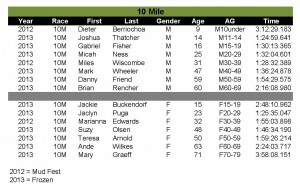 10/16/12: Note – Change in rules from 2012: If you sign up for the 50k race and choose to drop at the 20.3 mile point, this will be considered a DNF. Due to the confusion caused by numerous people choosing to drop and take a 20M finish last year, we are discontinuing this practice. 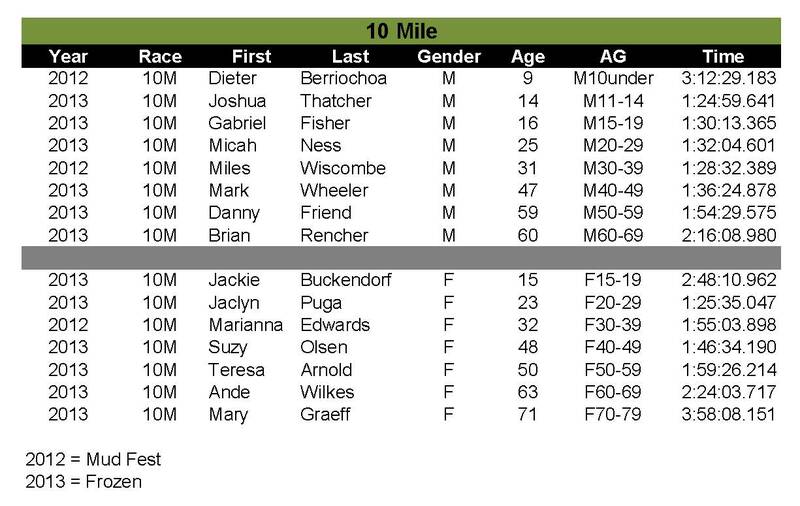 If you start the race as a 50k participant and do not finish 50k, you will not be listed as a finisher at any distance. You may change races up to 1/2 hour before race start, but may not change races once they have begun. Read news coverage and race reports from the 2012 race. Pictures from Michael Lebowitz of Long Run Photography are up! If you want to buy prints LISTEN UP- use the coupon code “Frozen” to get free ground shipping i.e. shipping like an ultra run…a little slower but you get there in the end. 🙂 Watermarked photo downloads are FREE! 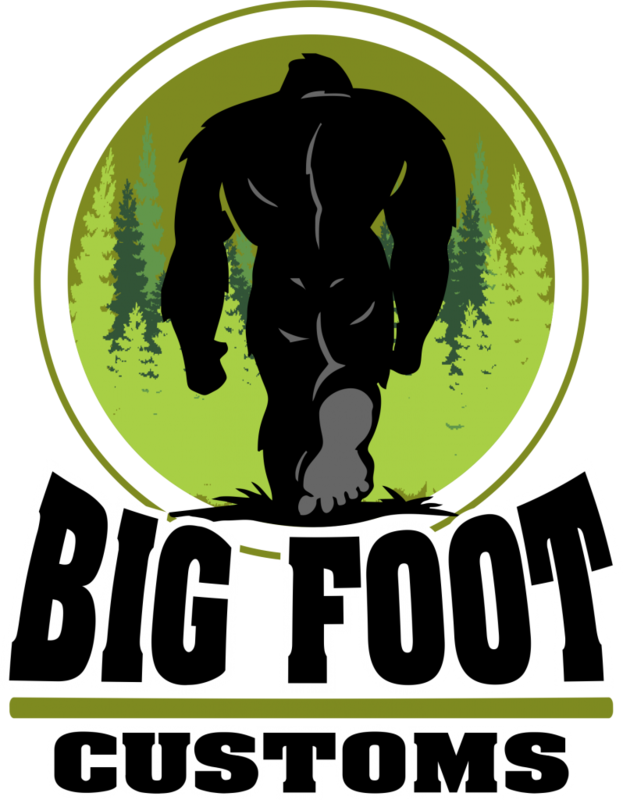 A big shout out to our ‘Frozen Stiff’ finishers: Michelle Anderson in the 10 mile; Tina Russell in the 20 mile; and Leah Wilsey and Heather Ramsdell in the 50k! Also much love to our 5 sweeps: Josh Ingram, Sam Collier, Tate Fischer, Bill Rupp, and Jon Kinzer! In 2011, we ran the Frozen 50k, Fatass style, just for fun, a small group of us out for a trail run. It was so much fun that we decided to do it again. The temps were very pleasant, cold enough for the ground to be frozen in the morning, but warming up by noonish to bring on some mud (i.e. Fruddy).